Green Canopy Cofounder, Sam Lai, was featured by Presidio Graduate School (PGS) in the article, "﻿Net Zero Hero﻿". Sam is an alumnus of the Sustainable MBA program at PGS — the graduate school that "educates and inspires a new generation of skilled, visionary and enterprising leaders to transform business and public policy and create a more just, prosperous and sustainable world." Presidio Graduate School has earned accreditation in the sustainability-sphere and acquired Pinchot University (formerly Bainbridge Graduate Institute). Finally, the biggest impact that I think graduate school has had for me, beyond some of the hard skills, is that when you go to Presidio Graduate School you're able to look deep within yourself, and understand how to optimize our own personal growth, and I don't think any graduate school is able to do that the way PGS does." AA: How did PGS teach you to think in systems? SL: One of the things we did in first quarter was systems mapping, which is its own discipline, where you look at different components of how the world is structured, how businesses are structured, environmental systems are structured. You deconstruct them, allowing you to understand the components and then you can see how they’re integrated. So often in business you might be a specialist and you might have mastery in one thing — but you may be working 100% in the wrong direction because you haven’t taken that high-level, systems-level view. AA: What is the most value that you took away from the Presidio Graduate School MBA Program? SL: The opportunity to practice and take big risks, and explore ideas, that typically — in the business setting — there just isn’t enough bandwidth or space or willingness from everyone, to just take a wild idea, to play with it, to deconstruct it, and to go all the way with it in a risk-free environment. I saw lots of people grow from not having much experience in public speaking to feeling comfortable with it at the end of the program. For me, I was able to take storytelling and public presentation and be able to have a very formal structure to bounce off of and play with to where now I feel very confident. I now have a process to be able to get from point A to point B in a very short amount of time because that’s what the process forces you to do. It says, “Okay you have an idea? Okay, test it. Prototype it. Get up and talk about it." That’s a lot of what we do in business. We iterate through ideas very rapidly — and that’s what’s required for progress. It’s really encouraging and energizing to see other people that are just as passionate about sustainability and improving our world and that they are professionals engaged in business, and the curation of those two characteristics are unique to the PGS tribe. Watch Shawna Cain's interview with Sam Lai below and read her article, "Net Zero Hero". Modern Builder and Design Magazine! We’re proud to share that we were recently featured in the Summer 2015 issue of Modern Builder + Design magazine! Our own Aaron Fairchild outlined Green Canopy’s mission, process, and motivations in the eight page spread. He speaks to the importance of recognizing the impact our builds are making on both the environment, and on the community around us. “With educational programs, green building and renovation techniques, and unparalleled community engagement, Green Canopy is as much a movement as it is a business. Green Canopy Homes’ earth-friendly ethos is not limited to an end product: homes, renovations- and now custom- properties that sell for up to $1.5 million and meet rigorous standards for energy efficiency, quality and beauty. The company goes beyond its relationship with individual homebuyers to try to affect change in the market overall- through innovative education channels and partnerships. The article continues on to highlight Aaron’s goals and specific processes for accomplishing the Green Canopy mission. He even mentions the Empower Happy Hours! We are also so thankful for Ballard Reuse, Northwest Electric & Solar, and Performance Insulation for being a part of this spread with us. This spring, after only 7 days on the market, G2B Homes entered into a sales contract for The Sequoia House! The final sales price was within .05% of our listing price, so we essentially were able to command our price – an excellent indicator of market response to our product. As a team, we couldn’t be more thrilled with the fruits of our efforts at taking a neighborhood eyesore and turning it into a lovely jewel of green and efficiency. Not only is it aesthetically beautiful, the house was certified 4-star BuiltGreen and energy testing revealed a tripling of its per-square-foot energy efficiency! I could go on and on about The Sequoia House (and encourage you to view our cool Before/After video here) and our innovative, sustainable approach to reviving homes in vibrant neighborhoods. But what I’d rather reflect upon is the affect this project has had on our team and the full complement of specialists and tradespeople who worked on this wonderful home. 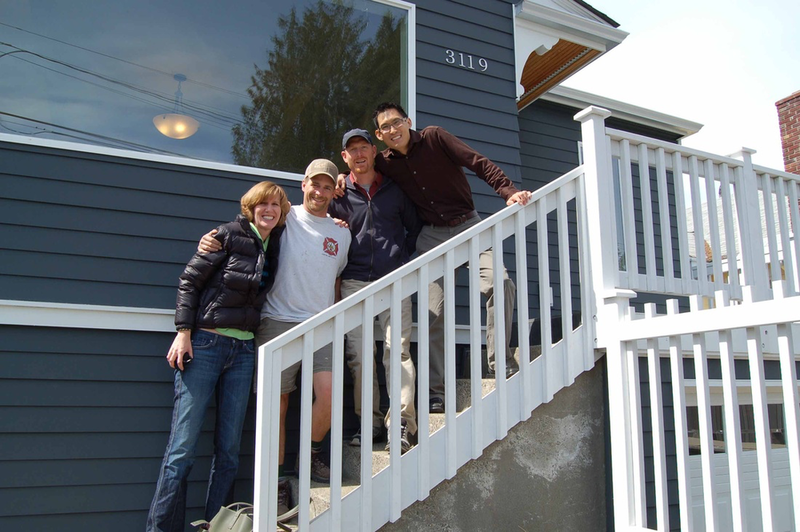 From our beginning “charette” meeting where we invited various experts to the house to give us their perspectives (captured in this KUOW radio story), to the local Eco-Building Guild seminar on air sealing, to the house color vote where 40+ votes were cast by engaged neighbors, the home became a place where people could come to imagine, design, learn, teach, and otherwise get involved in sustainable building. Some 86 tradesmen and women plied their skills during the course of construction, many of whom learned about advanced drywall approach, rain gardens, or solar hot water for the first time and can now employ these skills with future clients. And it won’t be the last time. Our team at G2B has proven to itself and to the market that our approach of turning existing homes green in healthy urban neighborhoods works. It really works - seven days to sales agreement, solid pricing, happy homeowners, and energy savings of 15,000 kwH/year certainly support this point! We are eager to get working on another home, and another, and another still. Our team has spent the past weeks documenting best practices, finding ways to be even better next time, and getting ourselves ready to roll. We are heading out to the investment community to raise the funds necessary to operate our company and bring it to scale. And I just want to say what a joy it has been to work on this project with such talented and passionate people. It’s a joy to make this one home consume a mere third of the energy it otherwise would. It’s a joy to have created not just a house, but a home that a community has touched. And it’s a joy to be working on sustainable, energy efficient housing in an era and community where these ideas matter.